During the planning stages of our trip to Poland, I compared prices of rail and air tickets from Warsaw to Krakow, and came to the conclusion that it made little sense for us to take a three hour plus train ride because the price difference was almost non-existent – A rail ticket cost about $50 US Dollars, while flying would go for just three dollars more. 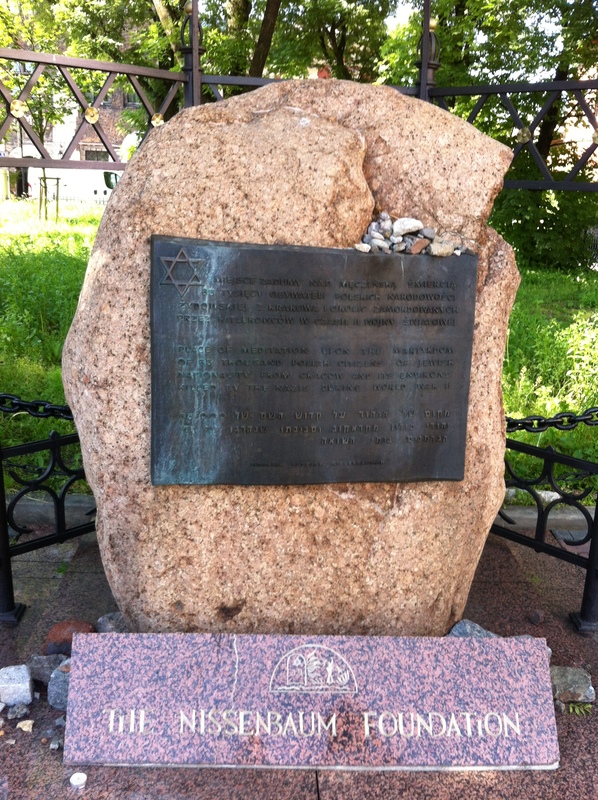 Once we had our dates set in stone, we purchased two one-way tickets on LOT and also booked two nights at Eden Hotel in the former Jewish district of Kazimierz, where much of Steven Spielberg’ Schindler’s List was shot. We woke up early on Sunday morning and went to the airport – it was quite crowded there, but we checked in without incident. There was one thing that amused me, though: as we checked our bags, the LOT employee took one look at my gig bag and realized that I was carrying a ukulele. I was surprised that she even knew the instrument – most think it is a violin case. The flight lasted about 30 minutes, and around 11:30 AM we were already at John Paul II airport. We got to our hotel about an hour later. 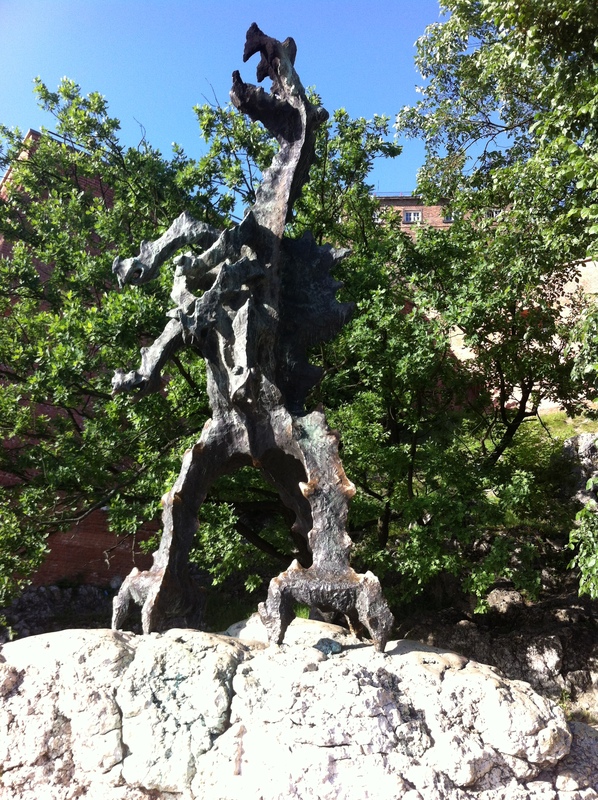 It was not easy to find since it was located in the heart of the Kazimierz District on a very narrow street. According to the hotel’s website, the building was erected during the 15th Century and served as home for a rabbi at the time. We stayed in a room on the top floor third floor that featured a solarium, a mini-fridge and TV. The hotel also provided free Wi-Fi (a feature that we also had in Warsaw), and it was conveniently located close to Wawel Castle and other attractions. As soon as we got settled in we walked outside and immediately found our favorite zapiekanka place, which is located in a former kosher butchery that is now part of an outdoor market. This is the same location I wrote about here four years ago, and is considered as one of the best in the country. We then walked to Cudny Josef, a local bar that happened to be open. It was a very hot day, so we stopped and spent some time there and had a beer. The bar was nothing special, but the drinks were cold and the atmosphere was quiet. 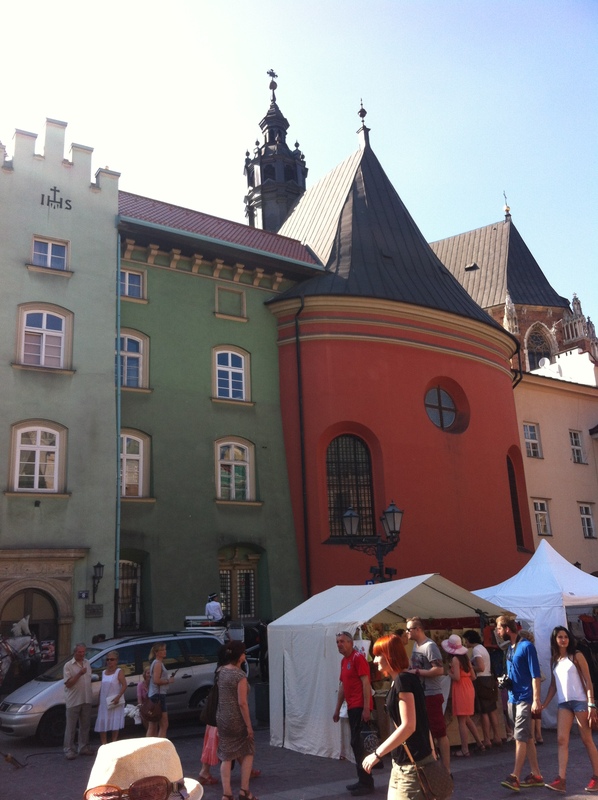 We made our trek to the little rynek near the town center, where the city’s “Music Day” was taking place. There was a band on stage clearly making things up as they went along, playing what seemed to be a mix of improvised Polish and Middle Eastern sounds. They sounded surprisingly good, and I hung out for a while Renata snapped pictures. There was a street fair going on, selling local delicacies like Oscypek (mountain cheese, a real delicacy), typical dishes and also locally crafted beer and wine. It was such a nice mood that I walked a few yards from stage and pulled my ukulele (which I had been carrying around for almost the whole trip) and risked a few tunes. Thankfully no one paid attention and I scratched the itch of playing my new instrument outside in public. 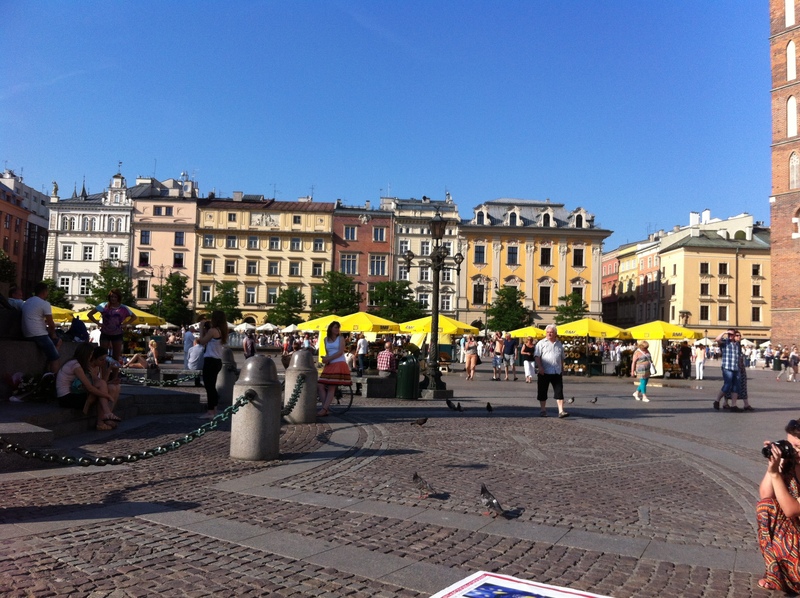 We then went to the main rynek where there was a literature and poetry manifestation going on for peace in Ukraine. Most readers were reading in Polish while volunteers collected signatures from the onlookers. Thankfully I had Renata around to explain me what was going on, and we both signed the petition for peace. We stayed there soaking up the atmosphere foe quite a long time, and then we slowly walked in the direction of our hotel. Summer in Poland has far more sunlight than in New York, so I was completely thrown off when I realized it was well after 9 PM and dusk has not yet come. 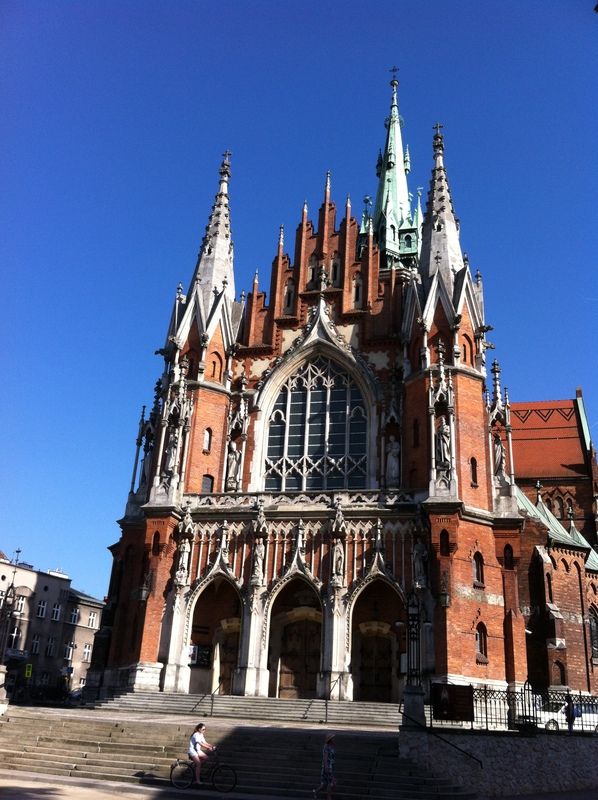 We stopped by the church where then-Father Karol Wojtyla ministered in his early days – we were planning to attend a classical music concert there, but balked at the ticket prices – something close to $ 40 US Dollars. Instead, we listened attentively to a Ukrainian accordionist who was playing full classical pieces on his own. His sound was so great that I just stood there and listened. We later chatted (he spoke English) and I bought one of the CDs he had for sale on his box. Following that, we had dinner at Horoscope (http://www.restauracja-horoscope.pl), a small family-owned restaurant where we enjoyed a typical Polish meal. 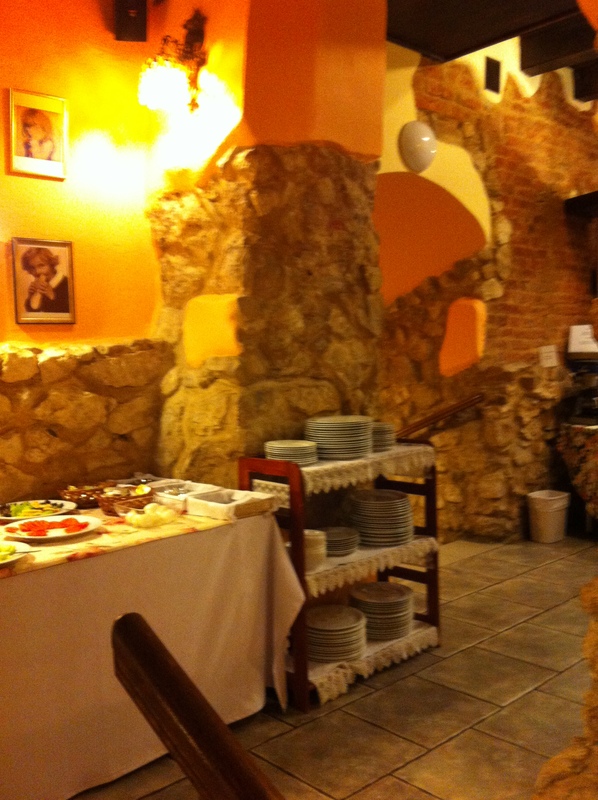 The place was quite nice, and we chatted with a few tourists after we finished eating. 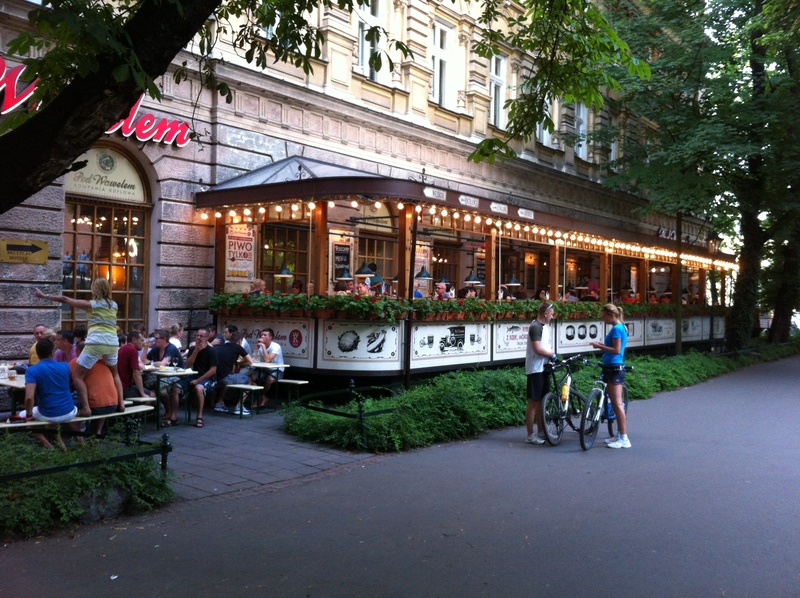 As night fell, we gravitated to Komisariat, a bar in the vicinity of our hotel. It was a bit of a dive bar of sorts with cheap beer and shots. We hung out there for a while, and I even got a few free drinks by playing a few tunes on the uke. I am not sure what time we left, but it was a memorable evening. On our last full day I had to take care of some stuff at the airport while Renata went shopping. In the afternoon we took the tram and found ourselves on the other side of the river on the Podgórze district, which later we found out was part of the Jewish ghetto (there were no obvious markings around, however). We walked around for a while and found a nice Italian restaurant called Makaronarnia (http://www.makaroniarnia.com). I was glad we landed there, because I had already gotten tired of eating Polish food every single day (something Renata makes a point to do when we travel there). The place was very cozy, and they had menus in English and in Polish. I chose penne alla rabiata, while Renata had linguini with chicken, if memory serves right. The portions were not as large as you’d find in Little Italy, but they were quite satisfying. After the meal, we walked around the neighborhood and visited the beautiful Gothic-style St. Joseph’s Church (http://jozef.diecezja.pl/beta/) and also walked into a music store where we found a bunch of ukuleles on display (apparently they have become popular in Poland). 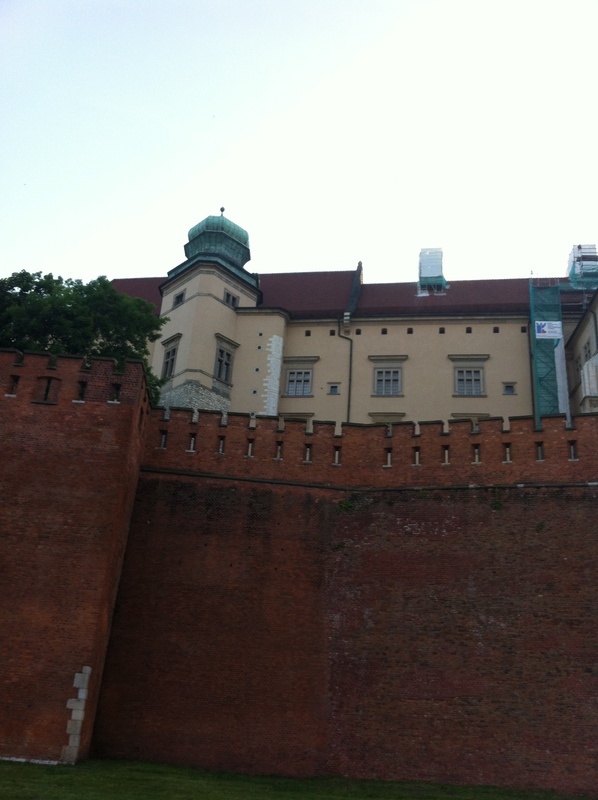 We then took the tram back to the Wawel Castle area and walked around it, taking in the feel of the neighborhood. As we made our way, we saw an irresistible ad for discounted beer at a bar called Pod Wawelem (http://podwawelem.eu ).We had seen the place before (there is an old beer truck parked in front) but thought it would be a tourist trap. We were not entirely wrong, but who can resist 400 ml. 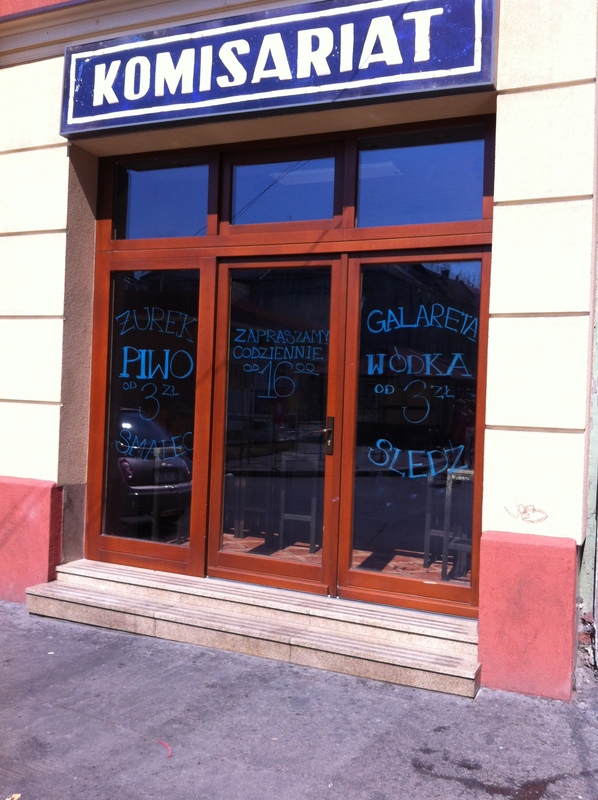 of beer for 3 zloty and a full liter for 7? The venue has all these daily specials, and this was the deal for Mondays. Established over 150 years ago, Pod Wawelem is adjacent to the Royal Hotel- it has a beer garden on the outside and a lively bierhalle on the inside. Past the doors is a full-service restaurant where a jazz band was performing live. Whoever designed the place has a sense of humor. There is a scale right at the entrance, and a sign showing the directions to Warsaw, Wawel Castle and another to the bar. 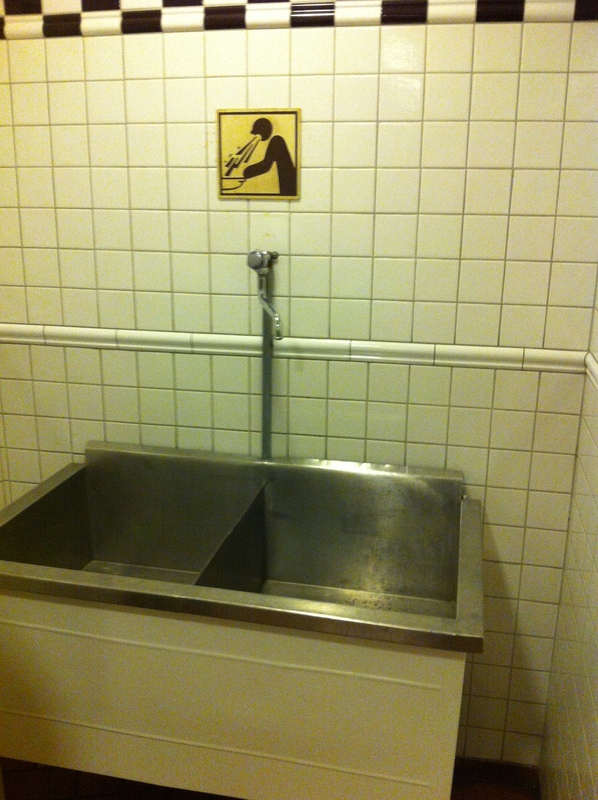 Inside the men’s room there are stalls labeled “beer” and “vodka, “ and next to them is a sink for those who need to, well, spill their cookies. Feeling overwhelmed? Here is the place to go…. 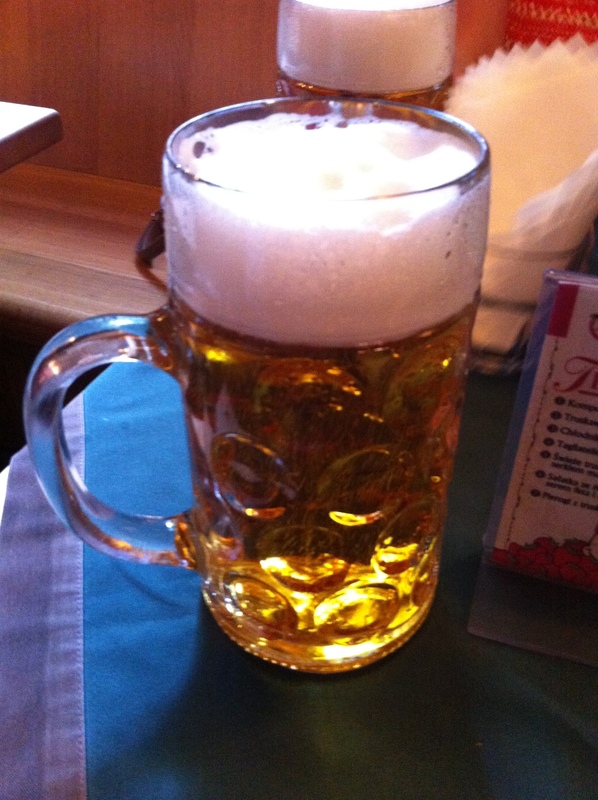 We sat in the bierhalle and ordered a liter each (I could not believe Renata actually went with it). It was quite overwhelming, but we took our time until we worked our way. I was faster than she was, and I ended up asking for a small one as I waited for her. Renata really wanted to have gofry (Belgian waffles topped with ice cream and fruit), so we walked around a little more until we found a good place to have it. I was not hungry, so I just sat there and had an espresso with a shot of cognac mixed in. 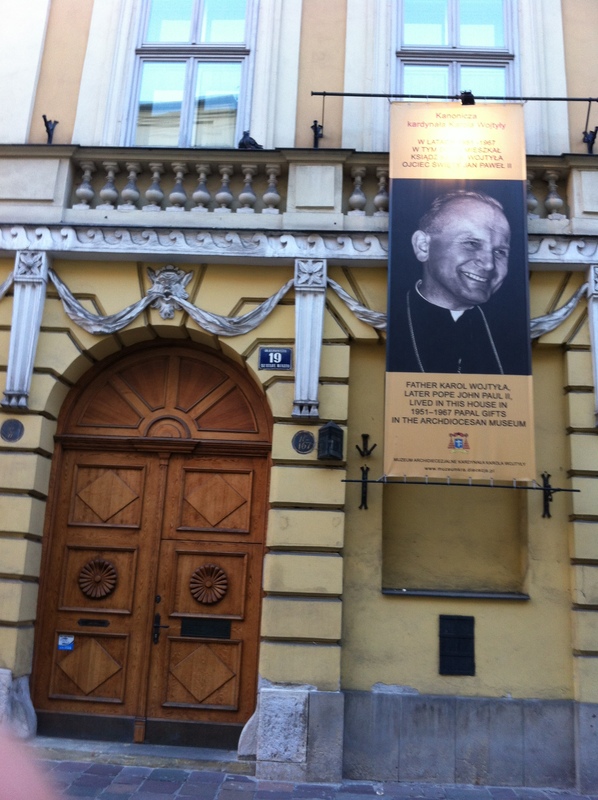 We followed the ‘footsteps of John Paul II” and stood in front of his home at the time he was a young priest. By 10 PM we were pretty tired, and we had an early start to come back home. We went back to the hotel, packed and consumed whatever provisions we had left in our mini-fridge. The following day, we took the bus back to Krakow Airport for the long trek that would take us back to Moscow to meet our plane back to New York. It was a pleasant trip, but time just seemed to pass way too quickly… as all vacations seem to be. Great summary of your trip to Poland!!! It was a pleasure to read about all the places that you visited, especially about the ones close to my heart. It is so nice to know that foreigners appreciate our country ….. Thank you again and I am looking forward to your next article. Thank you Marta… Please share this with others.